Candidates who have passed Intermediate with Bi.P.C.group are eligible for these two year Paramedical Diploma Courses. (If candidates with Bi.P.C group are not available Intermediate M.P.C. group and thereafter other groups will be preferred). DREST – 25, DAM - 10). DOM – 114, DRTT – 10). Selections in purely on merit basis upon aggregate marks obtained by the candidates in relevant group subjects excluding the marks in the languages. In deciding such merit, candidates who pass under compartmental system will be placed after candidates who pass under regular system. Rule of Reservation shall be strictly followed while making selection. If qualified candidates are not available in the category for Scheduled Tribes, the seats reserved for them shall be made available to Scheduled castes and vice versa. If qualified candidates belonging to Scheduled castes are not available, the left over seats reserved for them shall be treated as open competition seats and shall be filled up with the candidates of general pool. The Tuition fee per month per student is Rs.500/- ( Rupees Five hundred only) along with other special fees as prescribed in the Go MS No. 281, HM & FW(K2) Dept., dt.13.10.2010 or as may be revised by Government from time to time. 1. 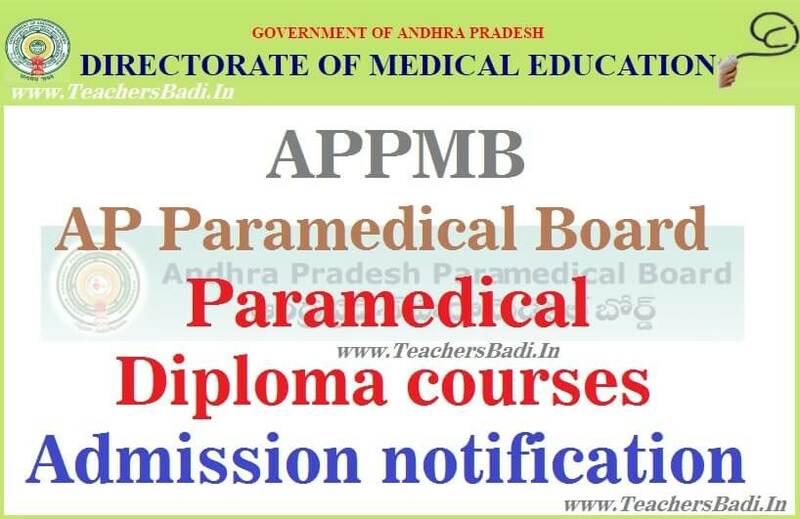 The medium of instruction in all paramedical courses is English only. The candidates should have to write their examinations strictly in English only. It is also notified that year wise examinations will be held from this academic year i.e., 2017-2017. 2. Minimum 75% attendance is mandatory for all candidates failing which they will not be allowed to write the examinations. No condonation will be allowed. The Principal concerned is authorized to collect a sum of Rs. 100/- (Rupees One hundred only) in cash for each filled in application submitted by the candidate towards processing fee to meet the incidental expenditure. How to apply: Filled in application form along with a sum of Rupees One hundred in cash towards processing fee shall be submitted to the concerned on or before 05.09.2017. Last date for submission of filled in application forms: 05.09.2017. Date of 1st Counseling: 15.09.2017. 1.. Filled in application forms should reach the Principals concerned. 3. Candidates shall not be permitted to change their social status or local candidature etc., after submission of application form. 4. Applications without required certificates and incomplete entries will be rejected automatically without any intimation. 5. The candidate has to pay the fee in full for the entire period of the course in case if the student desires to discontinue the studies and to take back the original certificates submitted at the time of admissions. 2) Copy of Aadhar Card. 3) Memo of the marks and pass certificate of the qualifying examination. (INTERMEDIATE or its equivalent pass certificate) including transfer certificate issued by the Institute from which the candidate has passed the qualified examination. 4) Certificate of study from 6th class to Intermediate. 5) If the Applicant belongs to SC/ST/BC, a copy of Caste certificate issued by the competent authority as proof of their claim for reservation. 6) The filled in application form along with a sum of Rupees One hundred only in cash towards processing fee shall be submitted to the concerned on or before ....... by 5.00 PM.